When Rochester’s weather is good, it’s glorious. And such was the case when Native Eatery and Bar held a ribbon cutting Tuesday at 3 City Center, the former Frontier building at 180 S. Clinton Ave.
One of the restaurant’s features, which was on full display Tuesday, is the louvered glass doors that fold open at the southwest corner of the building, creating easy access to the patio outside. The foldable doors will also allow patrons to enjoy whatever sunshine a stingy Rochester is willing to allow. For the restaurant’s ribbon-cutting, luckily, the sun was no miser and the air was pleasantly warm. Native – owned by native Rochesterians Ross and Lauren Mueller and executive chef Jason Carlson, will focus on locally produced foods and beverages. “It’s a lot more expensive to buy locally, but ethically, it’s the right thing to do,” Ross Mueller said. The three partners comprise Mueller Restaurant Group, which is also behind Label 7 restaurant in Pittsford. Ross Mueller said the menus will be similar, but the kitchen at Native is three times the size of the other restaurant’s. City and economic development officials lauded the renovation the restaurateurs made to transform office space into a tony restaurant outfitted with lumber from repurposed sauerkraut and wine barrels. 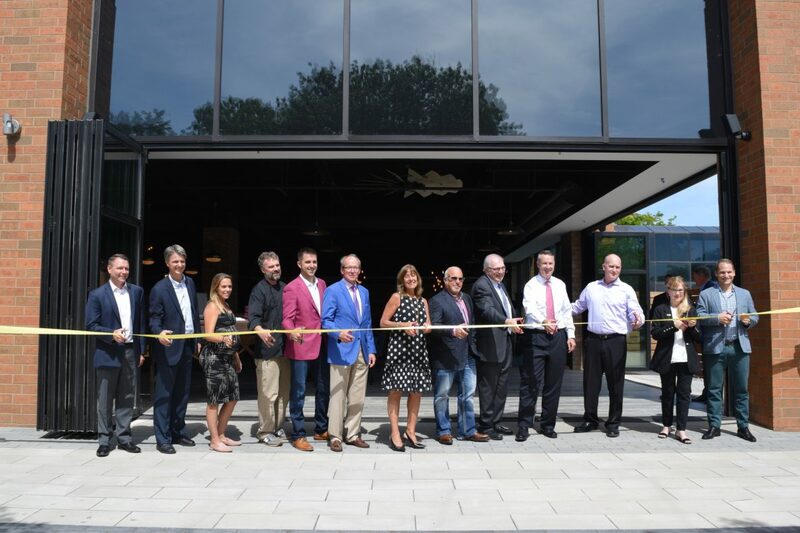 The restaurant partners also worked with the building’s owners – partners Peter Landers, Robert Sands, Robert Morgan and John “Dutch” Summers – to build staircases from the patio to the street corner at Woodbury and South Clinton. The stairs will allow a quick exit for diners trying to make a curtain time at Geva Theatre, which is kitty corner from the restaurant. “It’s a really fantastic building to be in,” Ross Mueller said, adding he felt like downtown had come full circle with his family. His grandfather had been an electrical engineer who helped build Midtown Plaza. His father helped out with the electrical work on the restaurant and now he owns a restaurant downtown. “We’ve been really thankful that there’s city momentum,” Mueller said. Heidi Zimmer-Meyer, president of Rochester Downtown Development Corp., meanwhile, said thanks are due to the new restaurant owners. “We just want to welcome you and thank you for taking a bet on a location like this,” she said. Both residential and business numbers are skyrocketing downtown, she said. “This is a corner that needed this,” added City Councilwoman Elaine Spaull. The east side of downtown is booming, she said, and it sometimes appears all the available land has already been developed. “When I think I’ve got nothing else, something like this happens,” she said. Yesterday’s announcement was followed by a reception, but the restaurant will only be serving privately while it trains its staff. Carlson said the official opening to the public will be announced once he’s confident the staff’s training is complete, with a grand opening to be scheduled most likely in early August. The restaurant will be open for lunches and dinners on weekdays, for dinners on Saturday, and will be closed on Sundays.